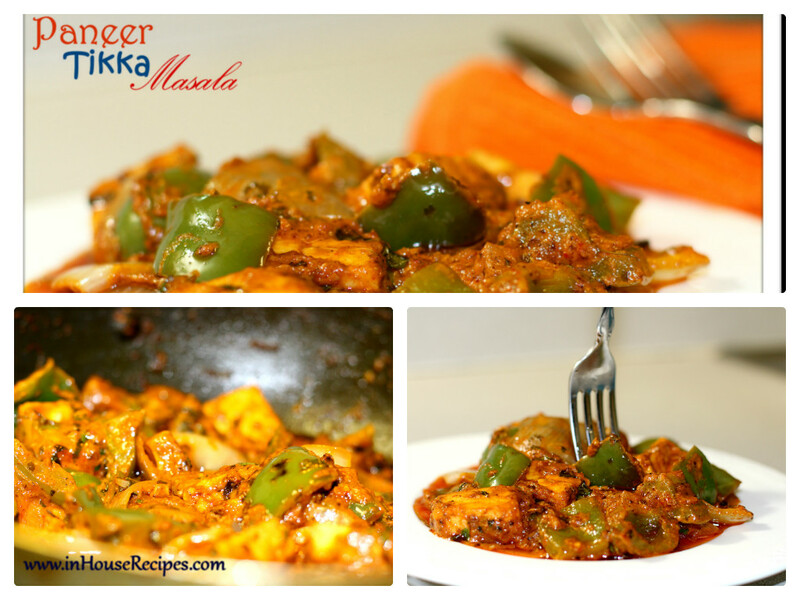 Paneer Tikka Masala is basically a combination of dry Paneer Tikka with the heavy gravy. Anil has this habit of eating out and then pushing Maahi to replicate the same taste at home. It is this habit which has helped us learn tricks of the trade and those secret restaurant recipes. To be very frank, some 3 years ago, we had a belief that no Paneer dish can be made to taste same as a restaurant simply because they use a dedicated ready-made Paneer masala powder. This myth was broken when Anil insisted to make it without any ready made masala powder at home. We tried multiple combinations of whatever spices were available at home and then one day could finally taste the heaven. See Also: Is Cottage Cheese equal to Indian Paneer? 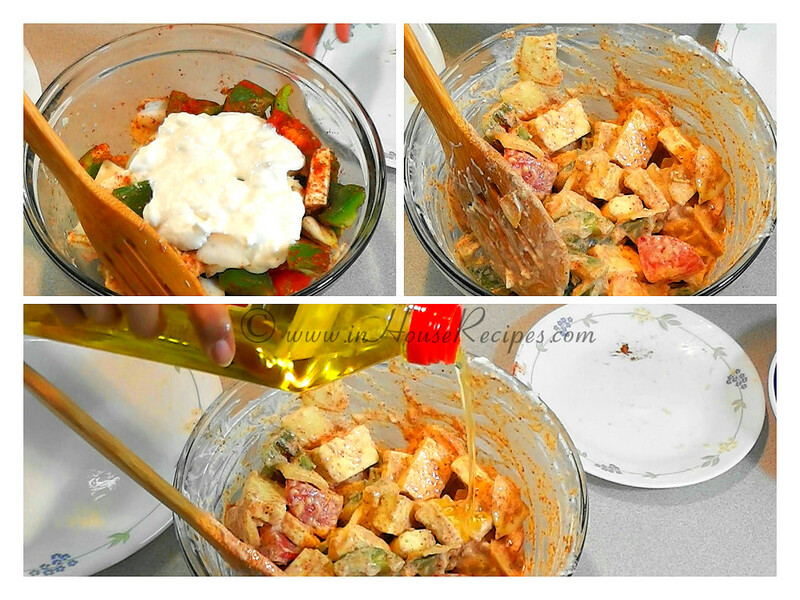 Normally, you would prepare the Paneer Tikka using the grill in your Microwave Oven. But, here we use a desi tawa (griddle). 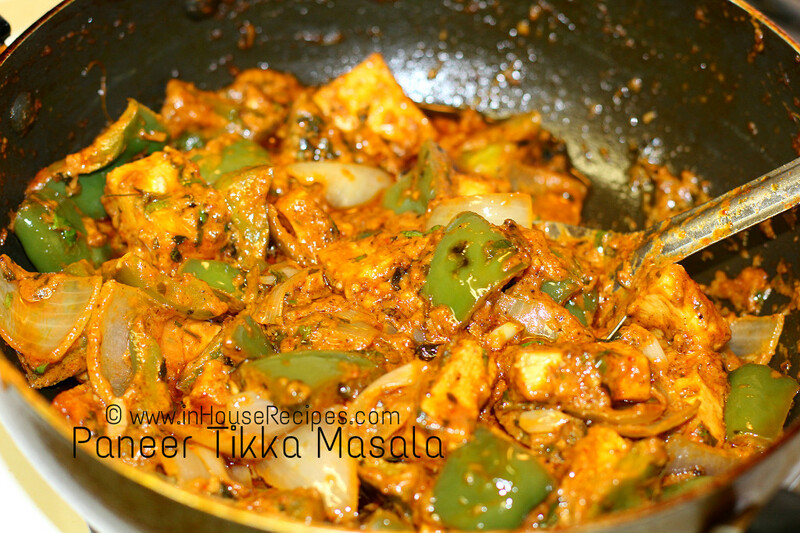 Paneer Tikka masala is different than the Paneer Makhani or Paneer Butter Masala. 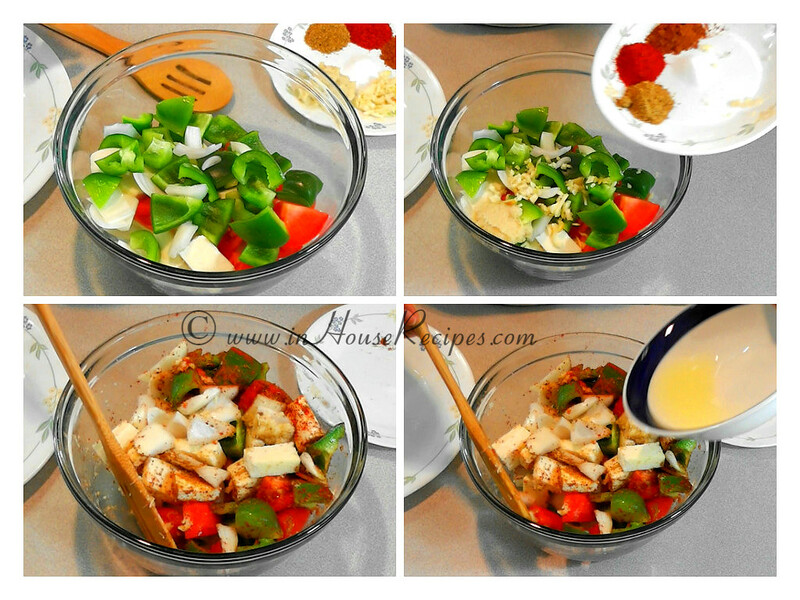 The primary difference is in the way raw Paneer is cooked. You can check our both the recipes to understand the difference. As a matter of fact, almost all Paneer delicacies have some or the other difference in their preparation and ingredients to create a variation in their finally taste. 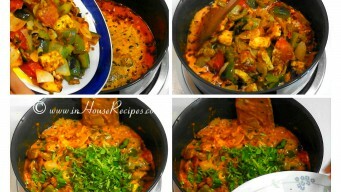 We analyzed one such difference of Shahi Paneer with Paneer Makhani here. 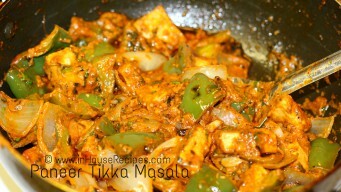 Some people also refer this recipe with the name Malai Paneer Tikka or the Paneer Tikka Gravy. 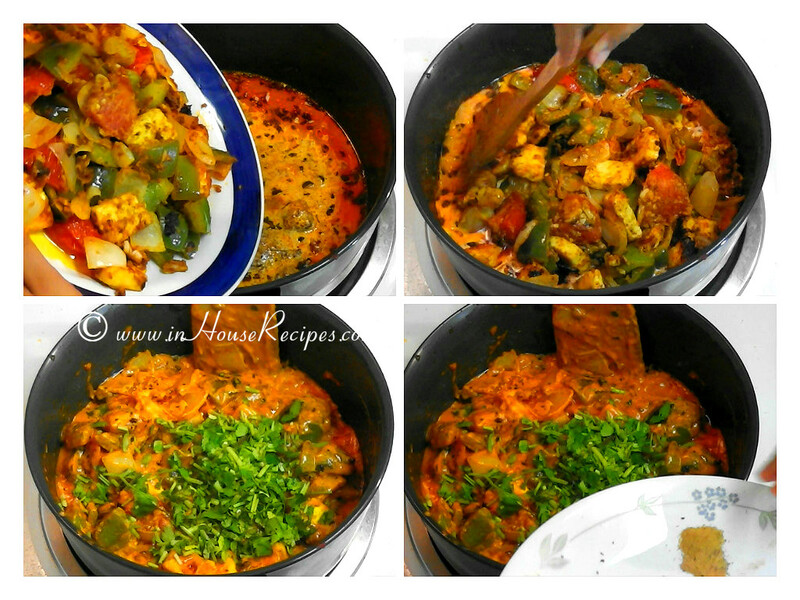 We share this recipe of making Paneer tikka masala at home with step by step images and a video in Hindi language. 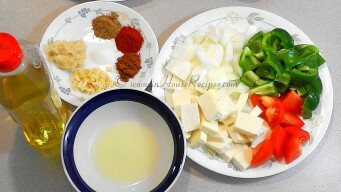 Ingredients for Paneer marination should now be ready. 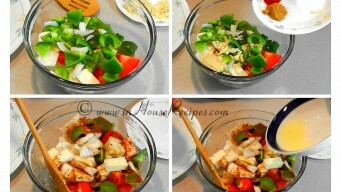 Add Paneer, Capsicum, Tomato and Onion in a bowl. Now add Ginger, Garlic and all spices designated for marination. Mix well. Add lemon juice, 2 Tsp Oil and curd yogurt. Mix well. Make sure that you use thick curd for best results. Keep it aside for 20 minutes. 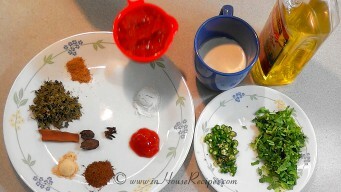 After 20 minutes of marination, lets start with making Paneer Tikka. 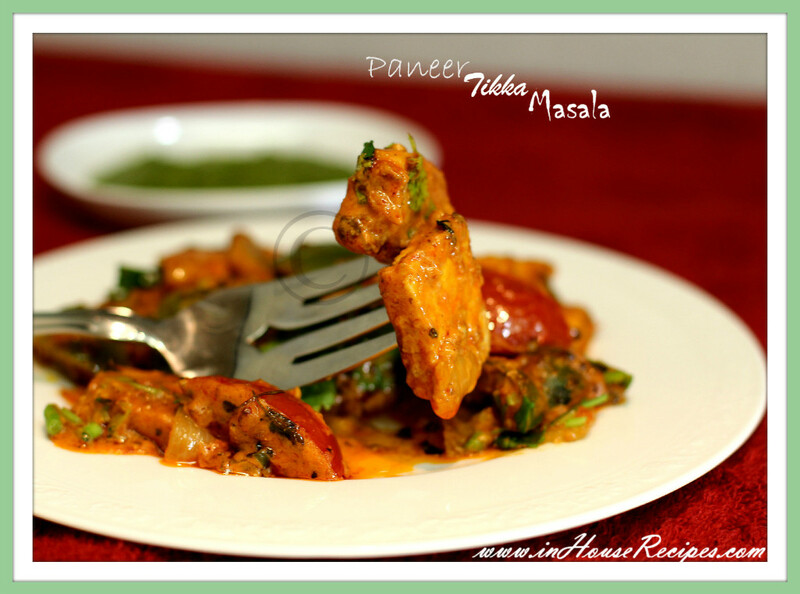 Paneer Tikka is basically made with exposing the Paneer pieces to direct fire heat on a grill. You can use that method as well if you have the set up. We are using a slightly different method of shallow frying the Paneer pieces. Take a pan, add 2 Tbsp Oil and heat it on high flame for 2 minutes. We mostly use Olive for our recipes as it is considered healthy for heart. It is also good for people who have high cholesterol problem. You can use any other cooking Oil as you desire. 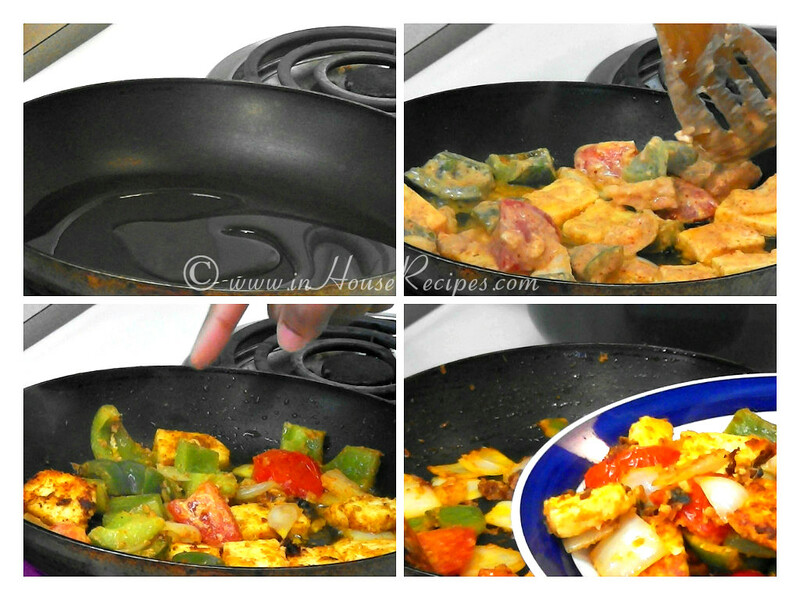 Once Oil is hot, Turn the flame on medium and add the marinated Paneer including vegetables pieces in the pan. The idea is to roast each piece of Paneer and vegetable just like we do while grilling. 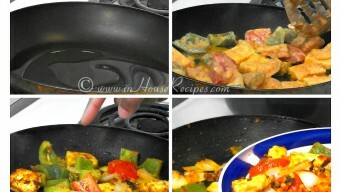 Hence, it is advisable to pick a single piece either Paneer or a veggie at a time and add it to the pan. Just fill up the space you have and do not overload the pan. You can use a second iteration in case your pan is not big enough to hold all the pieces together in one attempt. The fragrance of roasted vegetables and spices is just awesome. Our cooking stove is electric. Follow the same instructions for high / medium/ low flames even if you use the Indian style direct fire flame stove. Let it roast/shallow-fry on medium flame for 1 minute and then turn the flame on high. 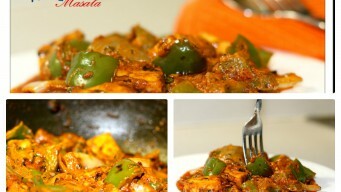 Let it cook until Paneer and vegetables turn light golden brown in color. You would need to flip or turn over the pieces once they turn golden brown from one side. Keep an eye to avoid burning. 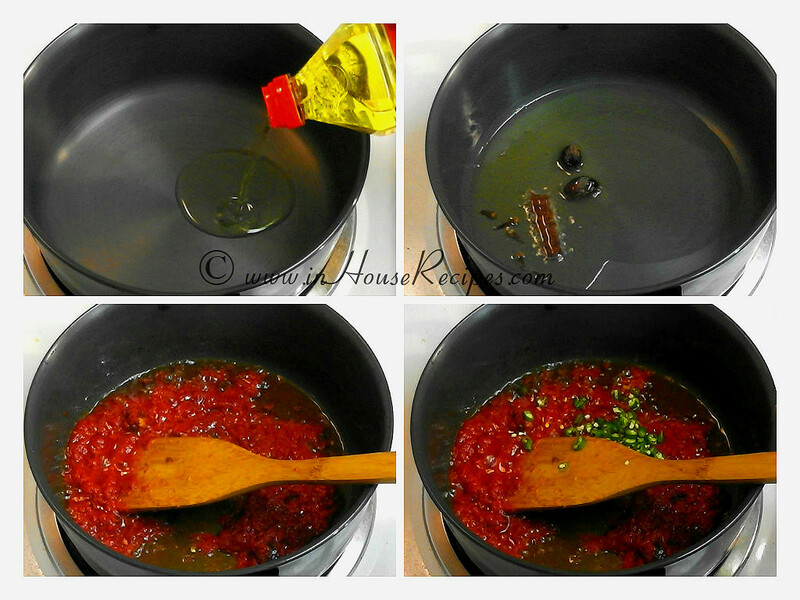 Once you see the colors on both sides, switch off the stove and take it our in a bowl. We will use it later. Lets move on to making Gravy now. Take a frying pan big enough to hold all the ingredients together. 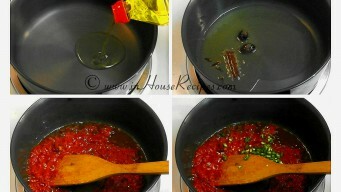 Add 2 tbsp of Oil and heat it on high flame for 3 minutes. Once Oil is hot, add Cinnamon, Cardamom and Cloves and roast for 1 minute. Whole spices add a unique flavor and essence to any dish. You can avoid them, if you don't have them readily available. 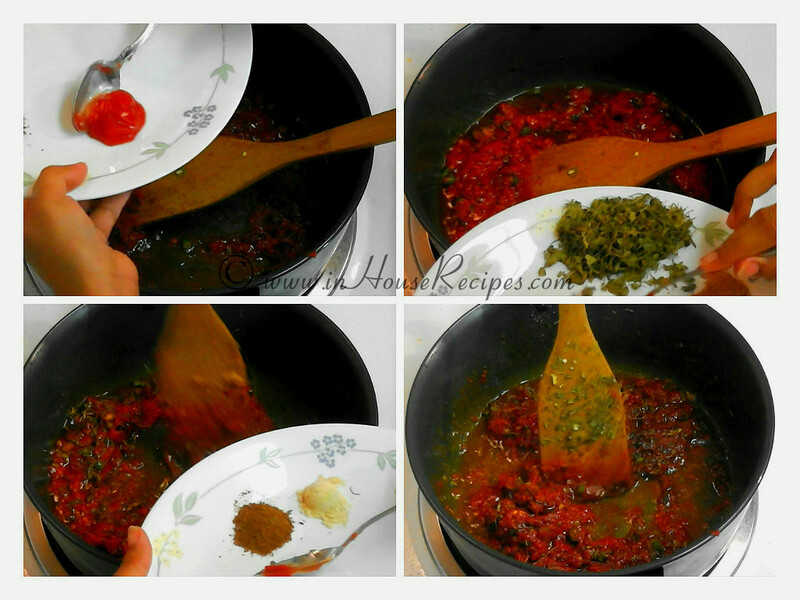 Now add Tomato Puree and Green chili. 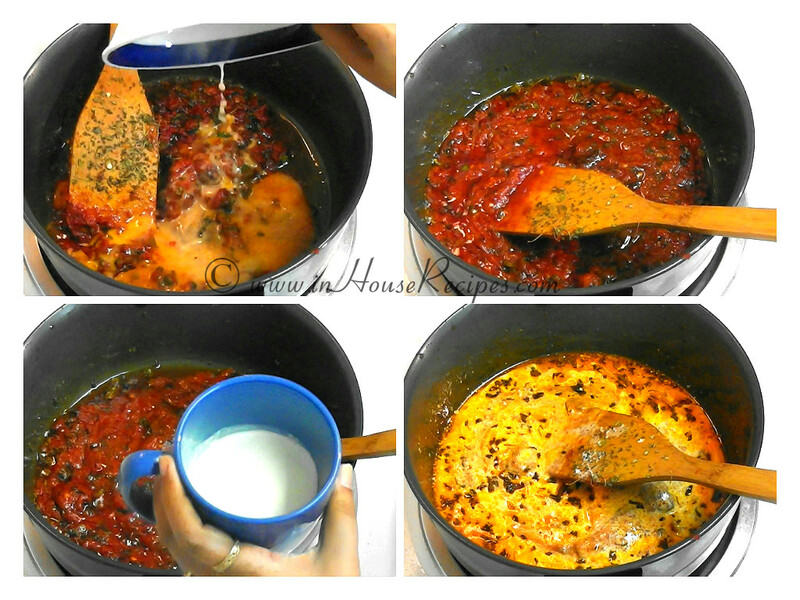 Mix well and let it cook for 1 minute. During this 1 minute of idle time, take a separate bowl to dilute CornFlour in 1 Tbsp of water. Keep it aside. After 1 minute, turn the stove to medium flame. 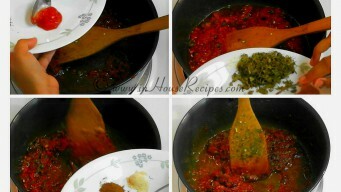 Add Tomato sweet Sauce, Kasoori Methi, roasted Cumin powder, dry Ginger powder, Salt, diluted CornFlour and mix well again. Let it cook on medium flame for 1 minute. 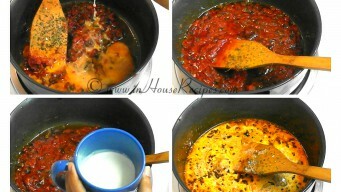 After 1 minute, add cream or Malai and Paneer Tikka. Mix well. Now add Coriander leaves and Chat masala. Chat masala is optional, if you want to skip it. It gives it a bit of chatpata (tangy) flavor. Switch Off the stove. 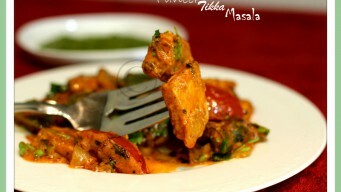 The delicious and rich Paneer Tikka Masala is ready to serve. Paneer tikka masala is served in main-course meals with breads like Paratha or Nan. Normally, you would also add a Dal Lentil soup like Dal Makhani to the meal with a Paneer sabzi Paneer dish. 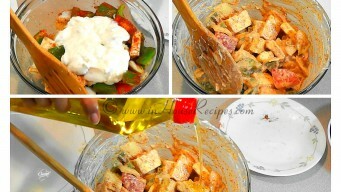 Paneer can be marinated for more time than suggested in this recipe in preparation for your party. You can prepare the gravy half and hour before serving. It can be refrigerated to preserve and consume for up-to 3 days for best taste. Re-heat using a Microwave or plain frying pan before serving again.